Kotka and the Sapokka marina - Sail in Finland! The city of Kotka is named after the island (Kotkansaari, Kotka island in English) on which the city center is located. Even though Kotka today is the biggest Finnish city on the eastern Gulf of Finland, it is actually quite a young city. Sapokka harbor in Kotka welcoming visitors. Throughout history, small towns and villages have existed on Kotkansaari, nearby islands and around the estuary of the river Kymi. The river was known for its salmon and the location was also well suited for trading. The area was part of Sweden until it was lost in a war and became part of Russia in 1743. In the 18th century, Kotkansaari has a special place in maritime and naval history. The waters just east of the island, called Svensksund in Swedish (Ruotsinsalmi in Finnish, meaning the “Swedish narrows” or “strait”) were the scene of two important Baltic naval battles, the Battles of Svensksund. The battles were part of the 1788-90 Russo-Swedish War where the cousins king Gustav III of Sweden and the Russian empress Catherine II fought each other. The first battle (in 1789) was lost by the Swedes but the second battle (in July 1790) – the biggest ever fought in the Baltic – was a major (and last) Swedish victory. After the war, Catherine II decided that Svensksund needed to be fortified. The fortresses were built on the smaller islands just outside Kotkansaari and the island itself became the location of the garrison town. In 1809 Finland became part of Russia as a Grand Duchy and Kotkansaari was (re)united with the rest of Finland. As there was no border close by anymore, the need for the fortifications was diminished. This phase ended in 1855 when a British-French fleet sacked the fortifications and burned down most of the town. 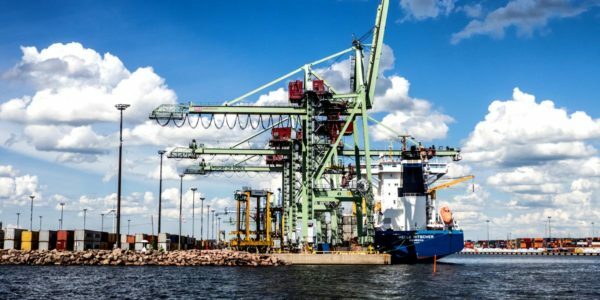 The Mussalo commercial harbor is one of the important elements of the industrial city Kotka. Just at this time, industrialization had started in Finland. The river Kymi was well suited for floating logs to the sea from the wast Finnish forests and in 1871, the first steam powered sawmill was built on the island. Other sawmills followed suite and already in 1878 the city of Kotka was established. The industrial era of sawmills and later paper and pulp lasted for about 100+ years. In the late 20th century, the paper industries started to face problems and many factories were shut down in Kotka and nearby Karhula. As a result, Kotka has had to look for a new fortunes. One of the focus areas of the renewal process has been tourism. Also those arriving by boat can today benefit from Kotka’s efforts to welcome tourists. 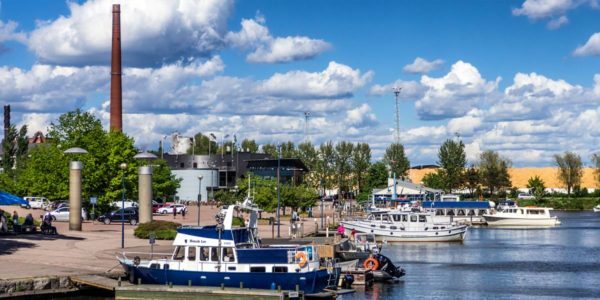 The best known tourist attraction in Kotka is the Vellamo Center, which is the home of the Maritime Museum of Finland and also of the Kotka regional museum. The maritime museum has a great collection of ships, ships models and other artifacts. The regional museum, often forgotten, tells in a very compelling way the history of Kotka and the surrounding Kymenlaakso region in which the sea plays a major part. The Vellamo center, home of the Finnish Maritime museum. 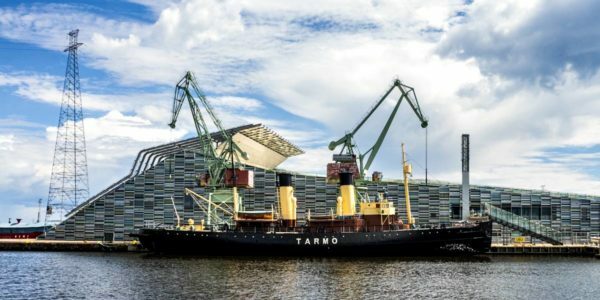 The historic icebreaker Sampo in front of the museum is part of the collections. An other attraction which could be very interesting to boaters is the Maretarium, a aquarium specializing in the Finnish underwater world and in particular the fish. 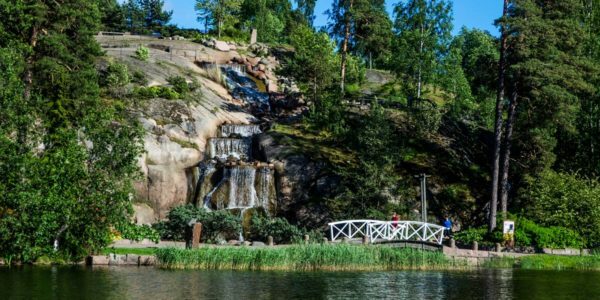 A third sight worth mentioning is the Sapokka Water Garden, possibly the most beautiful city park in Finland. Just the perfect place for a leisurely stroll. 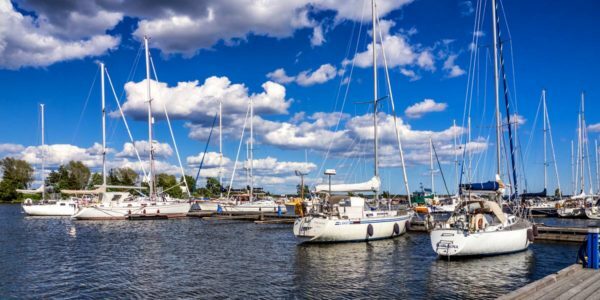 Sapokanlahti (Sapokka bay in English), on the south-east side of the city, is the yachting center of Kotka. 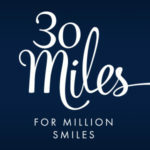 In addition to hosting local yacht and boat clubs, is is also the home of a modern marina. If you arrive from the south, you will first pass the Mussalo commercial harbor, easily recognizable already from far away. After the harbor, you will pass the memorial statue for the second battle of Svensksund on Varissaari, one of the former fortification islands. Now you can already spot the masts and boats of the Sapokka bay. As you approach the marina, you will sail right over the Svensksund battleground and many, many sunken ships. As you enter the bay, fuel and holding tank services can be found immediately after the breakwater, on the left (south). Further down the bay, still on the left, is the marina itself. The services offered are typical for modern Finnish marinas. They include showers and saunas, electricity on the jetties, waste disposal etc. The harbor office is located in the cafeteria just off the jetties and there are a couple of restaurants in the vicinity, the Meriniemi summer restaurant in the lovely Kotka yacht club building, and the Tulikukko and the Vanha fiskari (Old fisherman) restaurants at the bottom of the Sapokka bay, just a few hundred meters away. Panoramic view over the entrance to Sapokka. Left: Sapokka harbor. Middle: Svensksund battle area. Right (on the horizon): Suursaari (Gogland) island. If you feel like stretching your legs, you could take a walk up to the observation deck built on top of the demolished lighthouse just above Sapokka bay. From the observation deck you have a great panoramic view of the waters to the south and east of Kotka. A the bottom of the Sapokka bay, boats leave for surrounding islands. Here you also find the restaurant Tulikukko and the Maretarium aquarium. If you want to go a bit further, you find boats going out to the nearby islands at the bottom of the Sapokka bay. From here you can visit for instance Varissaari (old fortress, Svensksund memorial and restaurant), Rankki (former military base now open to the public) or even the outer islands in the Kotka archipelago, Tammio and Ulko-Tammio. Schedules for the boats (Finnish only) can be found here. The city center is just a few minutes walk away from the marina. There are good grocery stores in the center as well as other shopping and dining opportunities. If you need to travel to/from Kotka, the bus station with frequent connections to Helsinki is also located in the center. 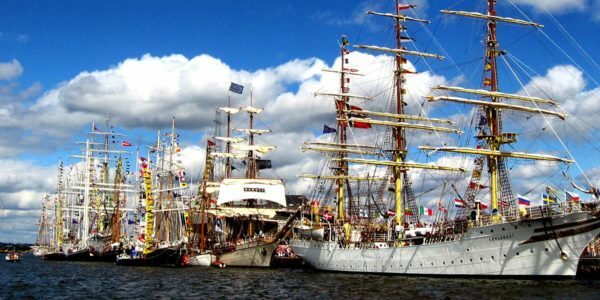 Tall Ships’ Races bring back a vision of Kotka as a former harbor city. Here the 2077 Races, teh TSR will visit Kotka again in 2017. Image: Wikimedia. 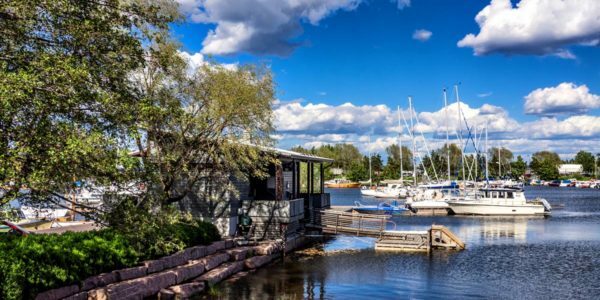 Kotka used to be known for its wild harbor life. If you want to spend a night out on the town, you should check out the restaurant Kairo, Kairo is a former seaman’s pub that still maintains s little bit of the “glory” of the wild days gone by. Worth a visit not only for the history but also for their music programs with jazz and dance bands. The video starts just below the Luotsi-Kuusinen island. 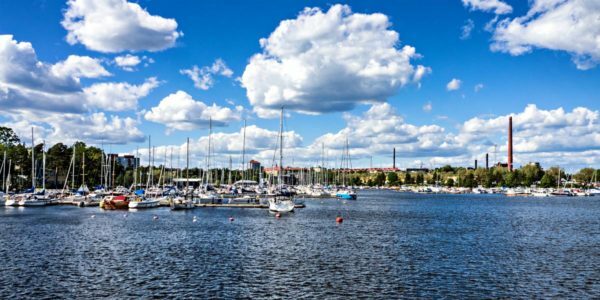 For more information on Kotka, check out the Kotka tourist info pages.